Derik displays his background as a visual artist through everything, from his plate designs, occasional artwork on our menus, to his tattoos. Derik grew up in a food-producing family that raised produce, made cheese, baked bread and caught and processed fish. 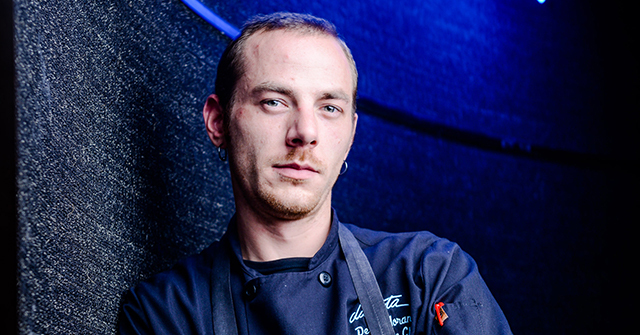 Starting his career in the kitchen at age 11, Derik became executive chef at Tagalong Golf Club and Resort in Wisconsin at age 18 and later worked at Relais and Chateau Property, Canoe Bay. Working locally at Porter and Frye’s and Nick and Eddie’s before the Dakota, Derik has plenty of experience. But experience alone does not account for Derik’s inventiveness and originality – his inventive food and ability to be so creative within such tight parameters demonstrates that he’s not only comfortable and practiced as a chef, but that he loves and respects food.